Researchers have figured out what makes certain chemicals accumulate to toxic levels in aquatic food webs. And, scientists have developed a screening technique to determine which chemicals pose the greatest risk to the environment. According to the study published today in Environmental Science & Technology, two traits were identified that indicate how chemicals can build up and reach toxic levels: how easily a chemical is broken down or metabolized by an organism and the chemical’s ability to dissolve in water. These traits account for how most chemicals concentrate, or biomagnify, in ever-higher levels as one goes up the food chain from its base to its top predators, such as fish, people, or polar bears. Chemicals that have the ability to biomagnify, such as DDT, can have adverse effects on human and wildlife health and the environment. “We need to learn from our previous mistakes and have more informed and responsible design and use of chemicals in the environment,” said Karen Kidd, a Canada Research Chair at University of New Brunswick Saint John and co-author of the study. “Our global review provides a straightforward approach for reducing the use of chemicals with the properties to concentrate through food webs. This is a critical step for decreasing risks for humans and wildlife from potentially harmful chemical exposures in foods.” The study found that poorly metabolized compounds tend to remain in animal tissues and are passed up the food chain in higher, more toxic amounts as one animal is eaten by another and so on. Likewise, compounds that don’t dissolve well in water accumulate in animal fats, ultimately exponentially increasing in top predators. Beyond these chemical properties, the researchers found that certain ecosystems and food webs are more vulnerable to biomagnification than others. For example, extremely high biomagnification occurred in ocean food webs that include birds and mammals. The authors noted this may be in part due to longer food chains in these ecosystems that is, many levels and kinds of predators - and because warm-blooded animals need to consume more food than do cold-blooded animals like fish. Building upon these results, the researchers developed a model of biomagnification based upon how chemicals metabolize and dissolve in water. The likelihood that a chemical would biomagnify was highest – nearly 100 percent - for slowly metabolized compounds such as chlorinated flame retardants and PCBs, or polychlorinated biphenyls, regardless of their solubility in water. Since the emergence of DDT as a global problem for wildlife in the 1950s and 60s, science has kept a close watch on the behaviour of persistent organic pollutants, especially chemicals that may concentrate through food webs to potentially toxic levels in wildlife and humans. Many are resistant to environmental degradation and remain in the environment for decades. While biomagnification can be measured in the laboratory, said Walters, it is best determined by measuring how much the chemical increases with each step in the food chain in wild animal populations. This is quantified with trophic magnification factors (TMFs) that are based upon how much chemical is present in animals at different levels in the food chain. This model provides a new global tool for screening existing and new organic chemicals for their biomagnification potential. 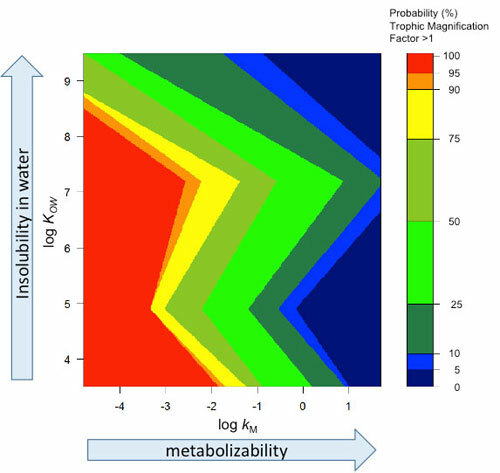 Hot colors (red, orange and yellow) indicate a high probability of biomagnification and cool colors (greens, blues) indicate a low probability of biomagnification. 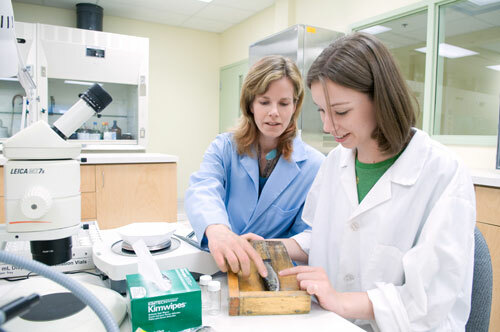 USGS research partners in this study, “Trophic Magnification of Organic Chemicals: A Global Synthesis,” include the Toxicology Centre at the University of Saskatchewan, the Canadian Rivers Institute at the University of New Brunswick, and Environment and Climate Change Canada. The study is published in Environmental Science and Technology. This research was supported by the USGS Ecosystems and Environmental Health Mission Areas, the U.S. Environmental Protection Agency's Great Lakes Research Initiative, and the Canada Research Chairs and Natural Sciences and Engineering Research Council (NSERC) of Canada programs.